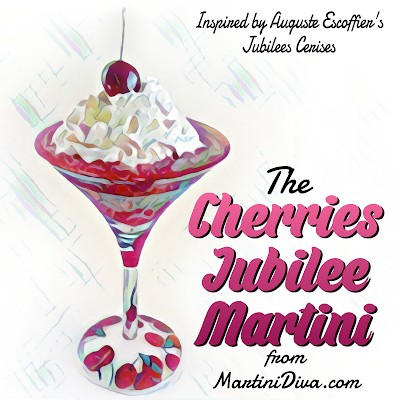 Cherries Jubilee is a classic dessert that was very popular in the 1950s. Made with cherries and brandy or Kirschwasser (aka Kirsch, a clear German cherry brandy) that is flambéed and served as a sauce, usually over ice cream. The recipe is the creation of famed French chef, Auguste Escoffier, who prepared the dish for Queen Victoria's Jubilee celebrations for her 50th year as Queen on the Golden Jubilee of 1887. 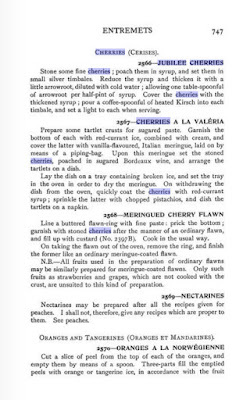 If you can find a copy of Escoffier's book, Le Guide Culinaire, published in 1903, you will find the recipe as "Jubilee Cherries." 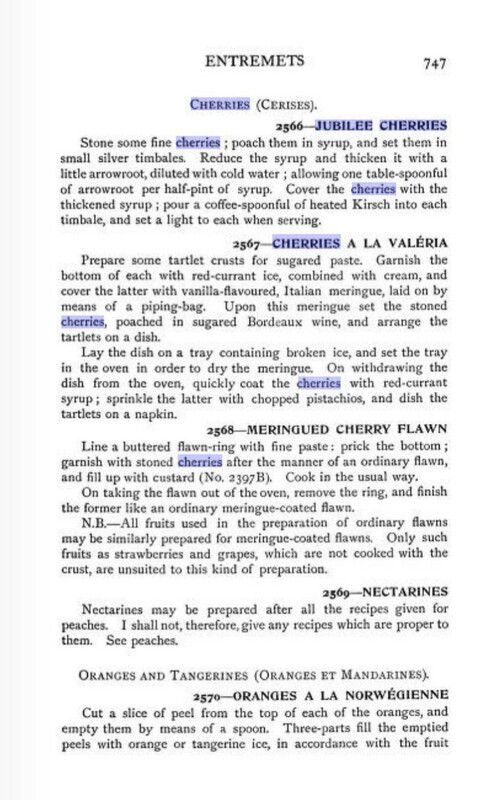 Escoffier's original recipe, which wasn't all that detailed, was basically pitted cherries poached in syrup with warmed kirsch "set a light", no mention is made of ice cream. The Escoffier Culinary Academy's recipe uses bing cherries, orange juice, corn starch and sugar then flambées this fruit reduction with brandy just before spooning it over vanilla ice cream. Inspired by both, my recipe uses two cherry brandies, Kirschwasser (Morello cherries) and Dekuyper's (Marasca) Cherry Brandy, orange juice and agave syrup as sweetener. Then I added Bacardi's Torched Cherry Rum for some extra kick and a little flambé touch and topped it with whipped cream in place of the ice cream. Fill a blender with one 1/2 cup of ice then add the rum, kirschwasser, cherry brandy, orange juice and agave syrup and blend until slushy. 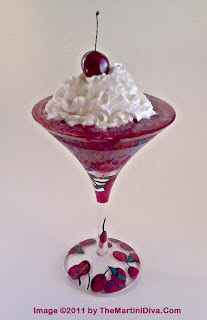 Pour into a chilled glass, top off with whipped cream and garnish with the fresh cherry. Melt a stick of butter, then add ½ cup of sugar, caramelize to a nice light golden color then quickly add the cherries and sauté until warmed through. Then, just before you serve, add a splash of Kirsch and cautiously set it aflame with a kitchen match and spoon this over your ice cream, pound cake or whatever! National Cherries Jubilee Day is September 24th.